Opti-Coat Pro Plus Delivers More Gloss & Greater Protection! The Opti-Coat Pro Plus Ceramic Paint Protection package now delivers even more gloss and slickness than ever before, while still maintaining the same chemical structure that has made it renowned as the ultimate protective paint coating. The advanced formulation not only delivers amazing gloss and protection, it also provides increased anti water spotting and hydrophobic properties to maintain the perfect finish in the long term. Opti-Coat Pro Plus is an enhanced 2 step version of Opti-Coat Pro. The first step, Opti-Coat Pro, is a ceramic clear coating with superior resistance to scratching, chemical etching, fading due to UV and provides outstanding release properties. Opti-Coat Pro Plus adds great gloss and slickness for a fantastic shine and long term paint protection. This service includes a 7 year warranty. Opti-Coat Pro is a hard wearing, ceramic clear coat for superior resistance to scratching (9H) and protection from chemical etching due to environmental impacts. The Opti-Coat Pro pre-polymer cross links, and forms a continuous protective film on the painted surface it is applied to, similar to a single component isocyanate that forms a clear coat finish. Opti-Coat Pro has better chemical resistance, scratch & mar resistance, and release properties than any automotive paint coating in use. 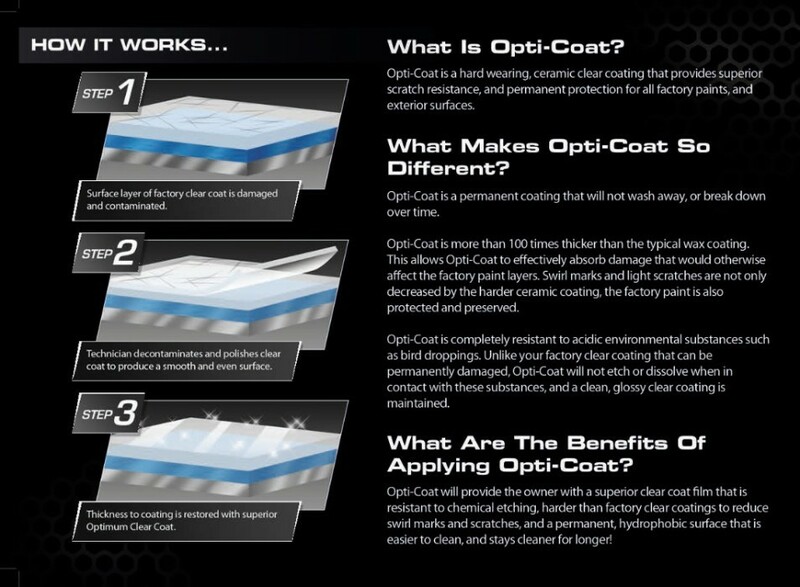 Opti-Coat Pro provides enhanced gloss and protection for your vehicle. This service includes a 5 year warranty. Optimum Paint Guard is a ceramic paint coating designed to protect the paint surface from bird lime, acid etching and other corrosive substances. Paint Guard will produce a harder than factory finish that is noticeably easier to maintain and is more resistant to the paint damage that can occur as a result of regular cleaning processes. This service includes a 3 year warranty. Improve Driver Visibility with Opti-Glass Pro! Optimum Opti-Glass Pro is designed to chemically bond to silica based surfaces to form a durable, hydrophobic coating that provides long term protection to glass and other silica based surfaces and to increase chip resistance, scratch and mar resistance and protect from water staining. Opti-Glass Pro provides increased chip resistance and will dramatically improve the drivers vision when driving in poor weather conditions with water being repelled from the surface at significantly lower speed than other products on the market. Opti-Glass Pro provides unmatched durability with multi-year protection. How Does it Work? Opti-Glass Pro works by creating an extremely high contact angle between the glass surface and water. This superhydrophobic surface means that the water droplets struggle to cling to the windscreen and roll off or are blown off as air passes over the vehicle. This enhances the performance of your windscreen wipers or negates the need to use them at all! Additionally, Opti-Glass Pro can increase windscreen chip resistance by increasing what is known as the coefficient of friction. This means, as an object comes in contact with the windscreen at speed, it is more likely to be deflected than to damage the glass. Superhydrophobic, Long-term Protection. Opti-Guard Fabric creates a superhydrophobic coating to protect fabric seats, carpets, fabric convertible tops and other textile surfaces. When liquids come in contact with Opti-Guard Fabric and closed loop textiles, the surface repels the substance and liquids roll off without penetrating or staining the material. Additionally, for materials with an open structure such as plush carpets where liquids are able to penetrate the surface, the coating prevents any penetration of the fibers and permanent staining of the material. How Does it Work? Opti-Guard Fabric forms a strong bond with the fibers to prevent removal during cleaning. This bond between the substrate and the coating creates a surface that produces a very high contact angle when in contact with liquids. Due to this extremely high contact angle, liquids are unable to attach or penetrate the fibers and are repelled in droplets. When combined with Optimum Fabric Cleaner & Protectant, the Opti-Guard system provides permanent protection for these surfaces. This service includes a 5 year warranty. Maximum UV Protection for Leather & Vinyl Opti-Guard Leather & Vinyl creates a hydrophobic coating with concentrated UV absorbers to protect leather seats and dashboards from premature aging, cracking, and other damage such as color transfer and staining of leather seats. Opti-Guard Leather & Vinyl is an acrylic hybrid resin that creates a strong, yet flexible coating for these softer surfaces and high resistance to chemicals. The coating contains special matting agents to maintain the original factory appearance of the surface it is applied to. How Does it Work? Opti-Guard Leather & Vinyl is applied liberally to the surface and left to be absorbed by the substrate. The resin penetrates the surface to produce a permanent bond within the material. This is particularly important for leather seats that are subjected to constant wear and abrasion. As the coating soaks deep within the leather, it is resistant to being removed through normal use. This service includes a 5 year warranty. Protect New, or Restore Old & Faded Plastic! Opti-Trim is a revolutionary two part system, to permanently solve the ongoing issue of faded plastic trim. Unlike other coatings that are limited in their lifespan and ability to prevent oxidation, Opti-Trim contains high levels of UV absorbers to help prevent future fading and provide a long term solution. Opti-Trim Protect is a clear, hybrid resin coating to help prevent new plastic trim from future fading due to UV exposure. For new cars, choose Opti-Trim Protect to enhance or maintain the factory appearance of your plastic trim. Opti-Trim Restore is a durable, hybrid resin coating containing special dye additives to restore faded and oxidized trim back to a like new, factory appearance. For older vehicles suffering from damaged trim due to UV exposure, choose Opti-Trim Restore to restore your plastic trim back to its former glory. How Does it Work? Opti-Trim Restore is absorbed by the plastic surface, giving back the life and colour taken away from long term exposure to UV rays. The Opti-Trim resin at the same time reacts with the plastic, to produce a chemical bond between itself and the substrate. Once cured, the resin is now bonded throughout the surface of the plastic trim to produce a new, durable surface that is highly resistant to UV exposure to maintain the new look. Protect your wheels! Opti-Coat Pro+, Pro, or Paint Guard can be applied to wheels and brake calipers.